It’s easy to have positive sentiment towards the stock market when things are going well, but the real test is always when the going gets tough. The last two weeks have provided that test for the bulls, and their response has been an all-out retreat. 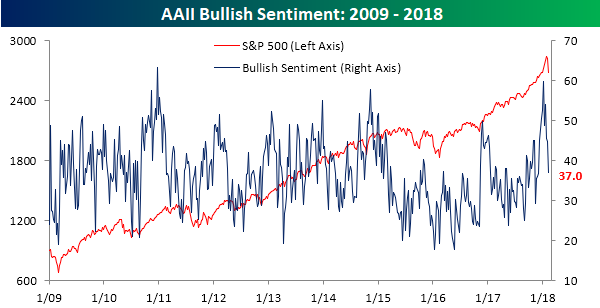 Based on the weekly survey from AAII, bullish sentiment declined from 44.8% down to 37.0% for the fourth weekly decline in the last five. 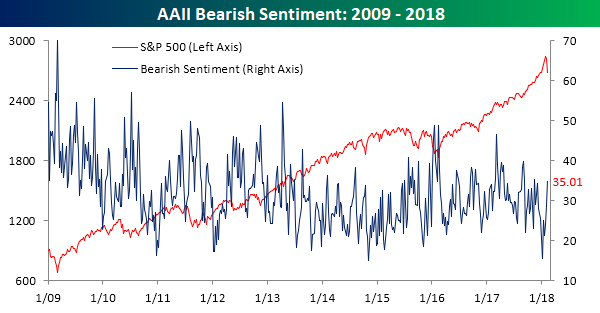 At the start of the year, bullish sentiment spiked up to just under 60%, but in the span of just five weeks, close to 40% of those newly minted bulls have already abandoned ship and shifted over to the bearish or neutral camp. As bullish sentiment drops back into the doldrums, bears have been on the prowl. In this week’s survey, bearish sentiment swelled to 35% from last week’s level of just under 29%. Since the first week of January, the size of the bearish camp has more than doubled from a low of 15.6%.